There are certain things to do in the late spring that will help lawns look their best throughout the summertime. This peak growing season is a key time to stay on top of lawns as they can quickly get out of hand. Here are things to do this time of year that will help keep your lawn in top condition. By this time you may have noticed that your lawn tends to have certain seasons for weeds. Dandelions usually appear first with hardier weeds showing up later on in the summer. Use an herbicide in late spring to help control the weeds in your lawn and get ahead of the never ending battle with weed control. Be sure to tackle weeds when they first appear as they will be easier to pull before they are fully matured. Consider putting on a light application at first with a second application if weeds persist. A good rule of thumb for mowing the lawn is to only take off 1/3 of the current grass height. Mowing too much in the spring can cause the soil to dry out as there isn’t enough grass to shade it and keep it damp. Grass will have a hard time growing in well if cut too short as it will develop deeper roots to get to the hydrated soil. Check your lawn grass type to know exactly how high to mow the grass depending on each varieties recommendations. Lawns have a hard time keeping up with the summer heat depending on your location. Make sure to water your lawn on a regular basis and check the soil often to see if more watering is needed. A longer soak that is done less often is actually better for the grass rather than short spurts of daily watering. Check with your local water authority during the summer to make sure that you are conserving water when needed. Water is most effective when done in the early morning before 10am. This will allow the water to have enough time to penetrate the soil before the heat has a chance to evaporate it. Avoid watering in the afternoon or night as it could be less effective and cause fungi to grow. You may have noticed neighbors who mow their lawn without bagging the clippings and it is actually a great idea. Not only does it save time and money to dispose the clippings, but it also helps fertilize the soil and encourage better lawn growth. Make sure to cut the grass at the right height for your grass type and let those clippings fall where they may to strengthen your lawn. Many beetles like to lay eggs in grass during the early to midsummer months. Make sure to fight such beetles like June Bugs and Japanese Beetles by mid to late summer when the eggs hatch. Treat your lawn with grub control and consider checking with your local agricultural extension office for the best time to put down grub control in order to catch the eggs before they hatch. A beautiful lawn is a great way to extend your patio season to your outdoor areas. 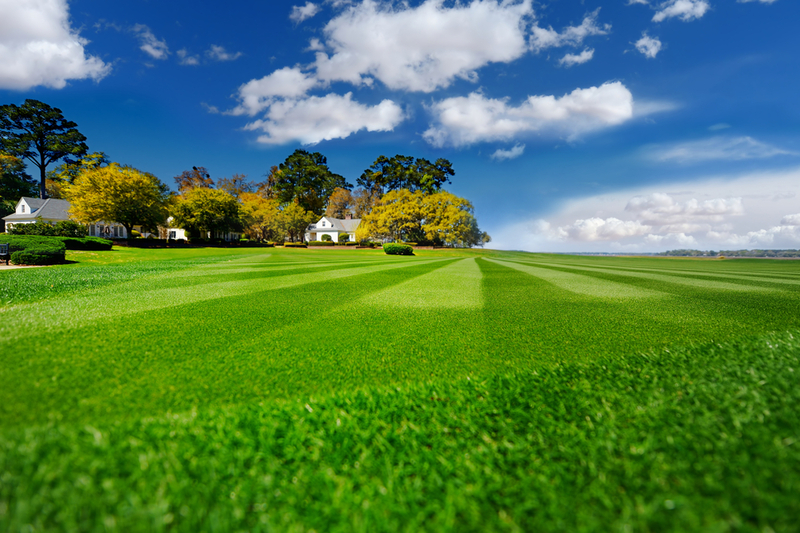 Depending on the season, lawns can need a lot of attention and care to keep them in top condition. Be sure to control weeds and resist the urge to cut too much in the spring. Once summer arrives, water your lawn in the early morning, don’t bag the clippings, and treat for grubs in order to keep a lush lawn throughout the entire season.